It is important that all dentists maintain current knowledge on the management of medical emergencies, and that courses or other educational programs on this subject are included in your personal continuing education planning. The College expects that all Ontario dentists and their office staff are prepared to recognize and manage medical emergencies when they arise. This article summarizes ways to ensure that this expectation is met. The management of a medical emergency in a dental office begins with assessment and, if necessary, treatment of airway, breathing and circulation by means of cardiopulmonary resuscitation. Most often, only after these basics have been addressed should the use of emergency drugs be considered. 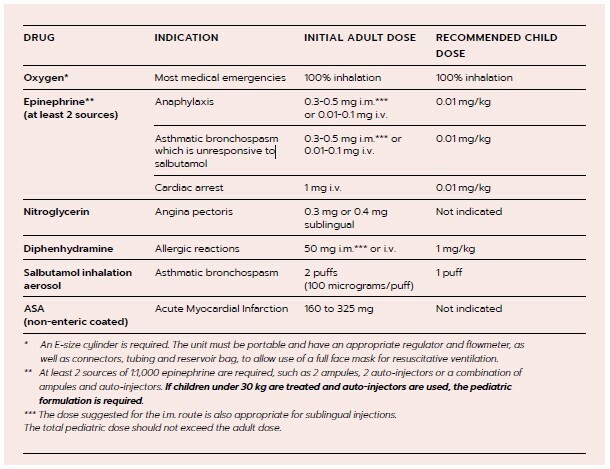 The accompanying table outlines the six basic drugs that must be included in the emergency kit of every dental office, as well as their recommended doses. Additional emergency drugs may be appropriate, depending on the nature of the dental practice. For example, all dental offices providing sedation or general anesthesia are required to have additional emergency drugs and armamentaria, as described in the College’s Standard of Practice for the Use of Sedation and General Anesthesia in Dental Practice. All emergency drugs must have current dates and be stored in a readily identifiable and organized fashion (i.e. labelled trays or bags). The arrangement of emergency drugs in such a manner assists dentists and staff in responding to a medical emergency in a capable and confident way, despite the emotional stress and anxiety created by the emergency. In addition to having an emergency kit with the required drugs, it is advisable that a quick source of glucose also be available. All dentists and clinical staff must have the training and ability to perform basic life support (BLS) techniques. It is strongly recommended that all dentists maintain current (i.e. within 2 years) BLS certification (CPR Level HCP), and that all dental offices are equipped with an automated external defibrillator (AED). All dentists providing minimal and/or oral moderate sedation must, as a minimum, maintain current BLS certification (CPR Level HCP), which must include a hands-on component. All dentists providing oral moderate sedation to patients who are under 3 years of age OR under 15 kilograms must also maintain current Pediatric Advanced Life Support (PALS) certification or current Pediatric Emergency Assessment, Recognition and Stabilization (PEARS) certification, which must include a hands-on component. All dentists providing parenteral moderate sedation, deep sedation and/or general anesthesia must also maintain current Advanced Cardiac Life Support (ACLS) certification, which must include a hands-on component. All dentists providing parenteral moderate sedation, deep sedation and/or general anesthesia to patients who are under 12 years of age must also maintain current PALS certification, which must include a hands-on component. CPR courses are offered across the province by numerous providers, including the Canadian Red Cross, Heart and Stroke Foundation, St. John Ambulance and others. In addition, all dentists should establish written protocols for emergency procedures and review them with their staff regularly. The College has approved multiple Category 1 courses on medical emergency preparedness by various presenters.